Caption slip reads: "Photographer: Emery. Date: 1951-09-09. Assignment: Machine gun bullets hit Long Beach. 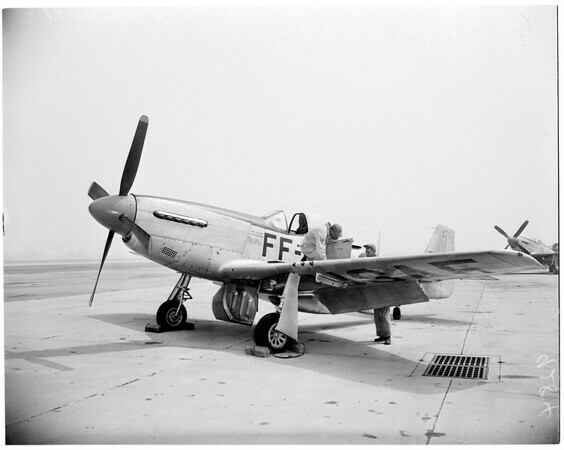 62/63: At LB Air Force Reserve base, P51 Mustang at 188th Fighter Interceptor Squadron which spewed 1576 bullets over Long beach gets 'complete investigation' after accidental firing. On wing is Sgt. Felix Chavez, 31, armament technician. On ground is Master Sgt. Emmett E. Leeper, 34".